Sure, a breathtaking ballroom or rustic farm are great locations for weddings, but when it comes to sentimental settings, it’s hard to beat home. That’s why backyard celebrations can be so beautiful. That is, if you know what you’re doing. Luckily, our NJ & NYC wedding photographers have been a part of their share of backyard affairs. So, we thought we’d pass along a few tips they’ve picked up along the way that should help. Make sure people can see & sit. Sounds simple enough, right? Well, you may be surprised. We’ve been to a few backyard weddings that could very well have been absolutely gorgeous. It’s just that we wouldn’t know because there was barely enough light to see. 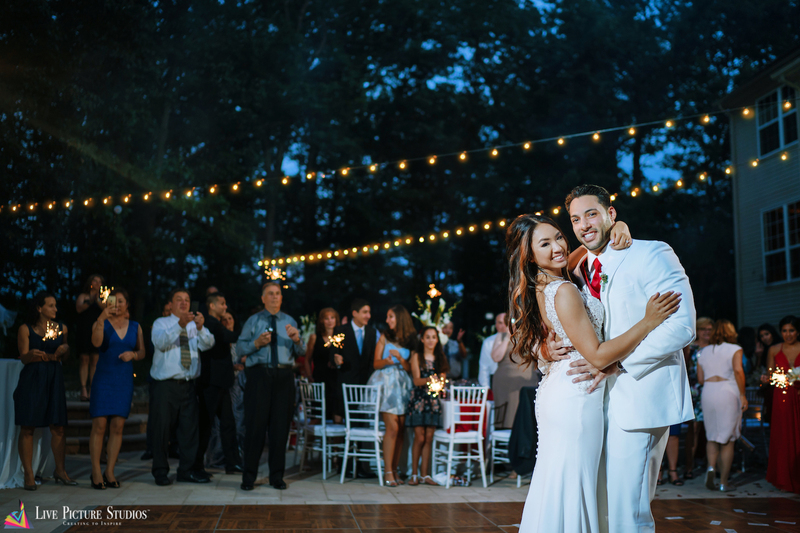 Okay, so maybe that’s a little extreme, but the point is that there are certain things you should strongly consider going to the pros for and when it comes to backyard weddings, specifically, getting some professional help with your lights is always a good idea. If you can’t, then make sure to add more lights than you think to the decor, and the same goes for seating. Choosing the right rental company for your seating is critical as you want to ensure everyone’s comfortable throughout the celebration. Choosing the right vendors for your big day is always critical and that doesn’t change when it comes to backyard celebrations. There are more potential issues than you may realize, but planners and vendors with experience at backyard weddings do. We, for instance, do wedding photography and videography and we can tell you that not every photographer or videographer can make at-home, backyard celebrations look and feel as epic as those that take place in a ballroom or scenic outdoor setting. The point is that putting the right people around you to help bring your backyard celebration to life will go a long way toward getting around some of the typical issues that tend to arise at them. Discuss the sitch with your neighbors. While there are plenty of tips and tricks out there for making your backyard celebration more unique to your and your partner’s personalities and styles, one thing you simply cannot forget about nor neglect is the neighbors. Again, this isn’t a friendly get-together we’re talking about here. It’s your wedding, which means more noise, more music, more people, more cars parked outside, etc. If your neighbors aren’t at least aware of the situation, then that could be a problem. So, make sure to speak with them about everything beforehand. If you go way back and they’ll actually be attending your wedding then it’s easy, but if not, just remember to let them know what’s going on and your expectations so that they can prepare. Backyard weddings are often some of the most memorable. The bottom line is, while your home and backyard may not be as vast and spectacular as an actual venue, it will provide something that no other venue can. It’s just up to you to take advantage of that. We hope this post helps. Good luck! About Us: Live Picture Studios is composed of a team of highly skilled NJ & NYC wedding photographers, videographers and editors who’ve been telling cinematic love stories for years. At LPS, we always create to inspire. Check out our photo gallery and video gallery to see some examples.